(Logan, UT — June 13, 2018) Altra welcomes champion ultrarunner Dave Mackey to its Elite Team, following the third anniversary of a horrific trail accident that resulted in the loss of his leg. 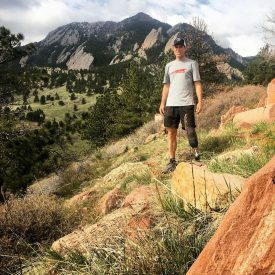 On May 23, 2015, Mackey was running Bear Peak near his hometown of Boulder, CO, when a boulder gave way, and he plummeted nearly 20 feet through rocks and branches. In the process, his left leg was pinned and badly fractured. Nearby runners heard Mackey’s cries for help and a complicated rescue ensued. Over the next 16 months, Mackey underwent 13 surgeries, suffered from multiple infections and experienced continual pain. With his leg not improving and more surgeries looming, he made the difficult decision to amputate his left leg below the knee. With the help of a prosthetic, Mackey slowly worked his way back to hiking, mountain biking and eventually running. Since then, he has run two ultra trail races and signed with Altra’s Elite Team. This summer, Mackey plans to tackle the Jemez 50 and JFK 50 Mile—which he won in 2003—and the entire Leadville series: the Leadville Marathon, Silver Rush 50 MTB, Silver Rush 50 Run, Leadville 100 Mile MTB, Leadville 10K and the Leadville 100 Mile. Mackey, a physician assistant, has won U.S. trail running championships for 50K, 50 miles and 100K distances. He won the North American Ultrarunner of the Year in 2011 and is a two-time USA Track and Field Ultrarunner of the Year. In 2011, he also became the first trail runner to run under 7 hours on the famous rim-to-rim-to-rim trail run across the Grand Canyon and back when he ran the 42-mile route in 6:59:56. Check out the Team Altra Facebook page to stay updated on Mackey and all of the accomplishments of Altra Elite and Red Teams. While working at a running store, Altra founder Golden Harper was frustrated that modern running shoe technology caused poor running form and had not decreased running injuries. His passion to create a shoe that followed the science produced Altra’s FootShape™ toe box and Zero Drop™ platform. Since its founding in 2011, Harper and co-founder Brian Beckstead have grown Altra from one to 25 shoe styles, winning multiple Editor’s Choice awards and distribution in more than 60 countries. Join the conversation @AltraRunning and #ZeroLimits on Twitter, Instagram and Facebook.